On Saturday, the only prayers I could offer up were the Litany from The Book of Common Prayer in the depths of shaking, horrified grief, just after we had enough hours of Internet to learn about the coordinated attacks in Paris — and, as not a few friends pointed out, suicide bombers in Beirut. The Litany was my outlet. Because what words can actually express the shock and horror that comes when violence is suddenly so relatively close, in a place so much like home? Paris, if you are curious, is 458.6 km from London, 1,094.8 km from Edinburgh, 1054.6 km from Berlin, 1,424.3 km from Rome. As a Canadian reference point, Toronto is 351 km from Ottawa, 541 from Montreal, 1,401.2 from Thunder Bay, 802.4 from Québec City, and 789.8 from New York City. That is to say that for us who live in Europe, Paris is literally close to home. I have friends in Paris. I have lived in Paris cumulatively for three months. It is a great city, and I love it. So what response is there, really? For times when we have no words of our own, there is the liturgy. And the Spirit, who intercedes for us with groans that words cannot express (Romans 8:26). Horror and terror have arrived home. We have been fortunate, have we not? Western Europe, after centuries of internecine strife, has been at peace — at least between member states — since 1945. And the amount of intranational violence (IRA, Mafia, etc.) has gone down as well. Most of our governments are fairly stable, and we have police forces and border controls and security services watching over us. To have one of our national capitals targeted — and to have the group responsible officially declare that Rome and London are on the list as well — is a very destabilising event. Which makes the difference between Paris and Beirut. Well, pray for Beirut. And for the many nations and cities where this sort of violence and horror are part of life (and, thus, death). Be thankful for the security and peace we have enjoyed these seventy years, then pray not only for their continuation in Europe, not only for the leaders of Europe who must seek wisdom and good counsel in the years ahead, but for the day when such peace and security can come to rest upon North Africa, the Levant, and the Middle East, for decades when they, too, can pass their days in rest and quietness. Lord Jesus, come quickly (Rev. 22:20). Anglicans in Paris? Fine by me! This morning I worshipped at St Michael’s Anglican Church, Paris, part of the Church of England’s Diocese of Europe. This morning was the most at ease I have felt at an Anglican church for a long time, and I am grateful for it. First, unlike a lot of other low Anglican churches I’ve met outside of Canada, there was liturgy. We prayed a prayer of confession together from the words of the PowerPoint. We followed the words of the Eucharistic prayer similarly. Second, the prayer of confession! I’ve been to a few Anglican churches lately, not just Scottish Episcopal but also the lovely parish of All Saints in Rome, where there is no real prayer of confession. At All Saints they had a section marked out as a prayer of confession but with no actual prayer — the minister would pray a blessing over water and then we’d all pray the Kyrie, leaving me scratching my head. Other places skip it entirely. Third, since it was a baptism Sunday, the confession of faith was orthodox! No ‘alternative confessions of faith’ as I met at one church in Edinburgh, and no simple skipping of it as I’ve met at a number of others. Fourth, we sang some classic ‘contemporary’ songs as well as two hymns. This use of old and new, this seeking for some sort of balance tends to make me comfortable these days. As did today’s song choices; the hymns: ‘Immortal, Invisible’ and ‘Amazing Grace’; the songs, ‘The Servant King’ by Graham Kendrick as the offertory and three others I actually knew during Communion. Fifth, the Communion liturgy was modern but carried within it the content of tradition. Sixth, the preaching was orthodox. The Gospel was Zacchaeus, the wee little man who climbed up in a sycamore tree for the Lord he wanted to see. And it was impressed upon us that Zacchaeus’ good works were the outcome and evidence of his salvation that came from Jesus, from grace alone. Also, we were reminded that love and invitation are where our interactions with ‘sinners’ should begin, not condemnation and judgement. Seventh, the prayer team. Whatever your liturgical bent, I think it is a healthy thing for a church to have available people with whom to pray. For most Anglicans, these people are available while everyone goes up for Communion. It is a salutary practice, for the Holy Spirit is real and here and with us. Finally, the church’s commitment to mission and ministry within the congregation, to the city, and to the world. Sometimes I feel like Anglicans exist just for themselves, or that everything but liturgy is social, or something. This is a church involved with the homeless of Paris as well as with the spiritual lives of its congregants. All in all, despite the fact that the interior of the building hadn’t got the memo that Paris cooled down over last night’s thunder storm, I was at ease. I felt like I was in the midst of fellow believers who worshipped in ways that I do and appreciate things that I do. This is not always a common experience. Yesterday I took advantage of free museum day in Paris to make my third trip to the Musée nationale du Moyen-Age (aka Musée de Cluny). Some items not previously viewed were on display, sometimes because they’ve redone some displays, sometimes because I may not have paid enough attention in previous visits. Anyway, besides some really amazing ivory carvings that really deserve their own posts, I spent a little time with some fragmentary Gothic sculpture. These three figures, you will note, are extraordinarily tall and slender. Kind of cubey around the edges, too. This is in part because they are, in fact, pillars. Since they serve an architectural function and are not stand-alone statues, they have been adapted to the space. Nonetheless, I have seen other mediaeval figures like this; this slender, elongated form is not reserved for Gothic column-statues. Byzantine icons also tend to be sort of … low on flesh, if you will. 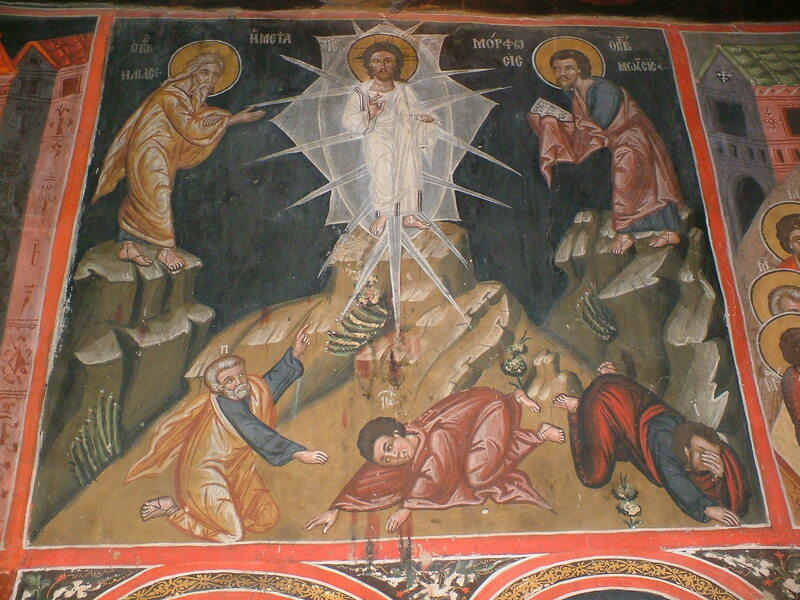 This lack of fleshiness was first pointed out to me on a trip to the Troodos Mountains in Cyprus, where our guide, Fr Ioannis, a painter and iconographer, asked some of the better-informed what struck them about some of the frescoes at Panayia Podithou. The answer: They look fleshier than a lot of classic Byzantine icons. The above is not my photo; mine was taken on my phone and is blurry. Nonetheless, this Byzantinising image is also very religious. In the centre is Christ who legitimates Otto II’s rule as Holy Roman Emperor; He is the largest, central figure, crowning the two monarchs who are dressed in Byzantine style. Compare it to my photo of this ivory carving of Christ crowning Romanos and Eudoxia in Constantinople a few decades earlier. What this waifiness signifies, I believe (and as the post title suggests), is the spiritualisation of the human form. It is not necessarily a retreat from the goodness of the human body; the East and West are both accused of this in the Middle Ages, but if you take this visual evidence with the written evidence of the best theologians, you will see that there was a very strong belief in the inherent goodness of the human body as part of God’s creation. In the Renaissance, the spiritual aspect of God’s good act of creating was found in expressing naturalism, from Fra Angelico to Michelangelo. In the Middle Ages, it was found in expressing spiritual truth. The human person is not only a pscychosomatic unity but also inspired, inspirited, spiritual. We are tripartite — spirit-soul/mind/nous-flesh. Naturalism grounds the image in the present reality too much for the mediaeval mind. The goal is to set the mind on things above (Col. 3:2). Therefore, not only in subject matter (Christ, his Mother, the saints, Bible stories) but in style, that which is above is transmitted to our minds through the art. The human form is elongated. Its muscle is toned down. It is still explicitly and specifically human in these mediaeval images. But now it is also otherworldly. It is spirit-and-body all at once. In a human face visible to you on the street today, you cannot see the soul. In contrast, in a mediaeval statue, ivory, or painting, you see the inner as well as the outer. This spiritualising impacts the art in more ways than this, but I’ll leave it there for now. The next time you see such a form, I hope its intrinsic beauty will strike you to spend some time in your own nous looking for the spiritual and then moving upward to the God of the uncreated light. *Here’s a happy-looking Romanesque Otto from a manuscript illumination. My deep, dark confession: Who cares? On Tuesday, I walked from the Parisian train station Gare du Nord to the Métro at Chappelle. This route takes you straight through the Indian section of town. I enjoy Indian parts of cities — such vibrant colours, combined with an abundance of people (which I can only handle in small doses), sometimes Indian music from shops or scents from restaurants, window displays full of multi-hued Hindu gods. All the usual stuff. As I walked, I actually prayed, ‘Lord, help me to be Your light in someone’s life today.’ A nice prayer. Soon there appeared a couple of white guys dressed in simple ‘Indian’ clothes with a dab of makeup on each forehead. And, of course, a satchel of books. Now, I’m not sure they were Hare Krishna, but that is a likely choice. They could have been western sympathisers to Hinduism*, I suppose. The elder fellow wanted to know if I was interested in a copy of The Bhagavad Gita. I admitted I was. He held out an astonishingly large copy in French, extolling the virtues of the Sanskrit being present. I admitted that English would be better. So he called over the younger guy who had gone off, and he brought me an English version of the same edition. But then I asked the price, and I’m not sure about buying a 10-euro copy of so large a book when it comes recommended only by the guy selling it — especially since I can get it out of the library when I get home. They tried selling me another book, but I said I was really only interested in The Bhagavad Gita. Having extricated myself, I walked on to catch the Métro. Do you notice anything about this story? What stands out to me is the fact that I did not try engaging with these guys at any level beyond the possible purchase. Ten years ago or even five years ago, I would tried to share the thunderously good and life-changing truth that is Christ, the Incarnate God. Instead, I stayed at the level of a business transaction and acted as unspiritual as anyone else. Then I moved on with my day. Now, you may not fault me for this, even though I prayed that I could be God’s light to someone that day. After all, how do you ‘naturally’ bring Jesus up in a conversation with Hare Krishnas? In Tuebingen, I was walking down the street one day and saw some Mormon Missionaries. Rather than engaging them, I extricated myself from the conversation as quickly as possible, quite nervous the whole time. I had zero spiritual conversations with my less-than-enjoyable flatmates in Germany. I do not bring up the Gospel with my unbelieving classmates in French class. Nor did I bring it up with the friends I made in Germany. In my second year of university, I was ‘Outreach Coordinator’ at my uni’s IVCF group. In my third year, I led an evangelistic Bible study. In my fourth year, I was president, seeking ways of reaching an unreached campus. I had encounters on the street with Scientologists. I talked with my roommate and others in my dorm about Jesus in first-year uni. I ran two Alpha Courses during my time in undergrad. I spent a year after graduation as a missionary with IVCF/IFES in Cyprus, leading evangelistic Bible studies and engaging in spiritual conversations with Hindus, Buddhists, Muslims, and agnostics. Today, I start to sweat when I see a Mormon!! This is my deep, dark secret. I believe in evangelism with my head. But I no longer believe in it with my heart. This is my dark, dark secret. So what business do I have writing this blog at all? *To be Hindu one must be born Hindu; conversion is not possible. The Spirituality of Gothic Architecture: Fiat Lux! Somewhere in the late fifth or very early sixth century, someone in the Levant, in Syria perhaps, composed a number of treatises on mystical theology using the pseudonym ‘Dionysius the Areopagite.’ The forgery worked, and for centuries people believed that these texts were by the convert of St. Paul. Pseudo-Dionysius, as this author is known, became very popular, with translations from the Greek into Latin, Syriac, Armenian, and Coptic, and was read widely throughout the various churches and communions of the Middle Ages; his popularity only waned in the modern era, when the hoax was revealed on the one hand, Protestants like Martin Luther declared him unbiblical on another, and – on the third hand – scholars detected and discussed his ‘Neo-Platonism’, a charge many a Christian theologian has had a hard time shaking. The spiritual theology of Pseudo-Dionysius is about the glory and majesty of the Creator God whose very nature and power overflowed into the creation of the universe. God Himself is the light, and our goal, our telos as His creatures is our return to Him, our ascent and encounter with the celestial hierarchies. Our return, our reditus, is achieved through asceticism and mystical contemplation. The Christian pedigree of these ideas lies within the trajectory of Origen-Evagrius-Cassian (as so much does!) with similarities in the Syriac Liber Graduum and St. John Climacus. The imagery of exitus–reditus is an integral part of the Summa Theologiae of St. Thomas Aquinas, and Dionysian spirituality is the cornerstone of St. Gregory Palamas’ theology. But more about them later. For more on Pseudo-Dionysius, check out The Catholic Encyclopedia. As stated above, Dionysian spiritual theology was very popular very quickly. He is quoted by Mar Severus of Antioch, the Monophysite patriarch almost right away (if you do not believe these works to be by St. Paul’s disciple), and is soon translated into Latin. His popularity in the West increases, no doubt due to the prestige attached to the name as well as the importance of many of his doctrines, such as the incomprehensibility of God, and his similarities to the popular monastic writer St. John Cassian. And so, in the ninth century, Hincmar of Reims, a scheming, strategising Carolingian bishop with a large library at his disposal, a knowledge of canon law, and a desire to see the fortunes of the western Frankish realms increase, took up Pseudo-Dionysius’ cause. Already the easy confusion of people named Dionysius had probably begun; Hincmar skilfully accelerated the process. The Areopagite was merged with a martyred bishop of Lutetia (Paris), who had died there around 250 (en français il s’appelle St. Denis). 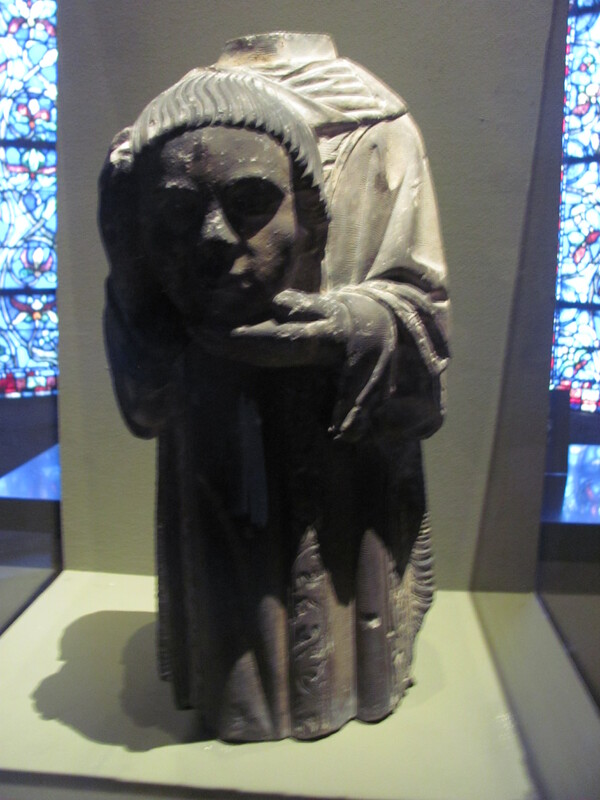 St. Denis of Paris was a martyr of the mid-third century who, along with his companions, was beheaded by the Romans on Monmartre (Latin: Mons Martyrum), today in the North of Paris. Upon being beheaded, he took up his head and walked to the site of the future basilica and declared that he was to be buried there. What we know for certain is that there was a Christian church on the site since at least the fourth century and that there seems to have been some sort of crypt beneath. 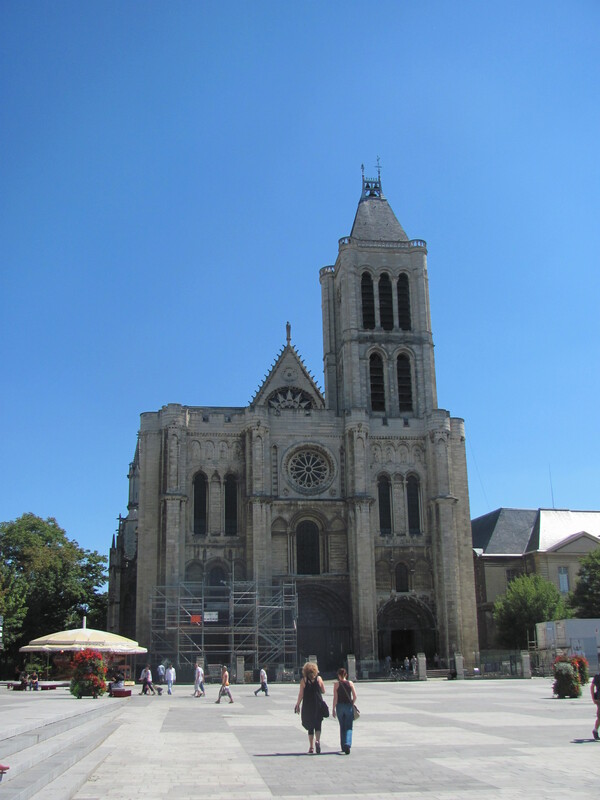 The church was rebuilt in the Carolingian era and again later on when the abbey that came to be connected with it increased its fortunes through royal associations – starting with Dagobert I (d. 639), the majority of the kings of what we know think of as France were buried there. Eventually, the abbey and its Romanesque basilica got a new abbot, Abbot Suger (abbot 1122-1151). 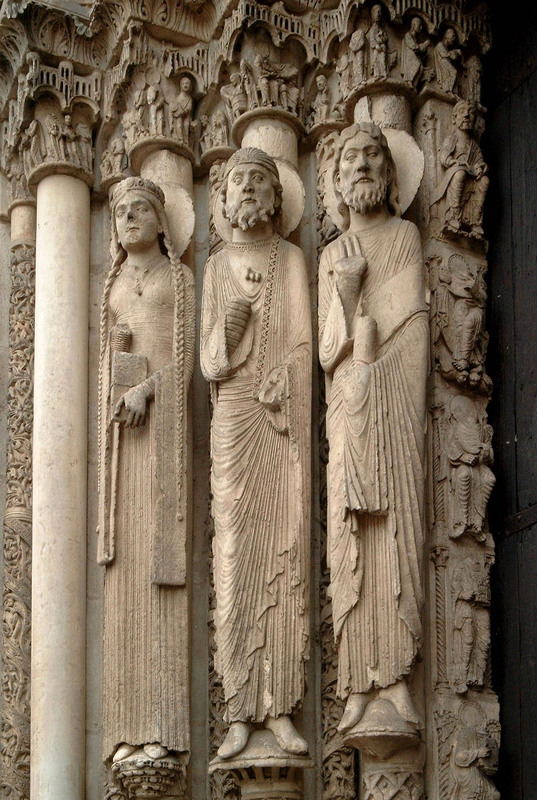 Suger, it seems, was a reader of his abbey’s patron, St. Denis (the Areopagite, of course; that this is a likely possibility, read this article about twelfth-century Dionysian influences). And the cornerpiece of Dionysian theology is light. God is light (is Christ not the light of the world?). Therefore, Suger rebuilt the apse with a double ambulatory as well as the chevet. The apse of a church is the round bit that sticks out the back and frequently houses the holy table; an ambulatory is a space that allows you to walk around the back of the apse; a double ambulatory is one such that has two aisles, with side chapels radiating out from the apse where priests can say private masses. The chevet is the entryway that you pass through before the narthex and nave. 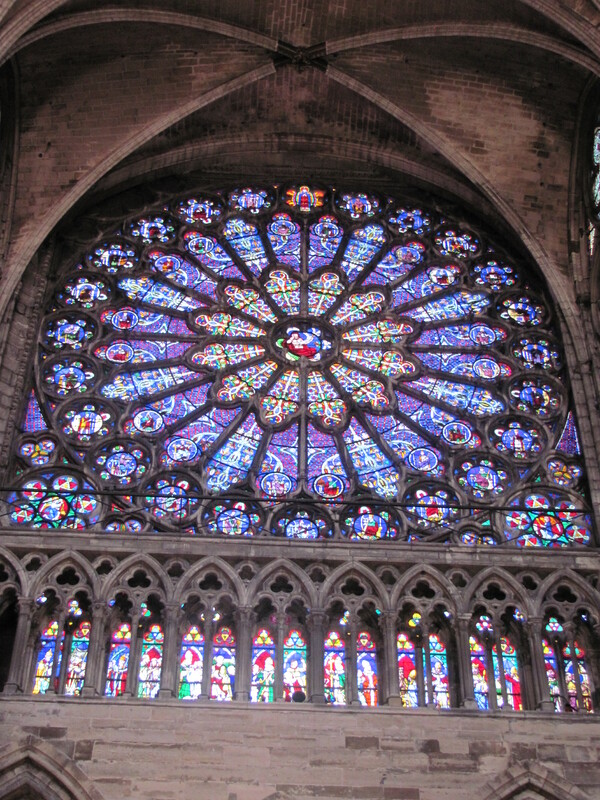 What Suger created was the oldest existing Gothic architecture. When I visited St. Denis, a request was made to explain what makes it Gothic. The appellation has nothing to do with Goths, first off (it is a Renaissance denigration). Gothic architecture is light and airy, whereas its predecessor, Romanesque (Norman), is still heavy, blocky, dense – although late Romanesque such as Durham Cathedral is moving towards the airiness of Gothic. The most important feature for this airiness is the pointed arch. Pointed arches enable the builders to span wider spaces. Thus, we get such places as the majority-Gothic Duomo in Milan and York Minster that have very high ceilings and very wide naves. 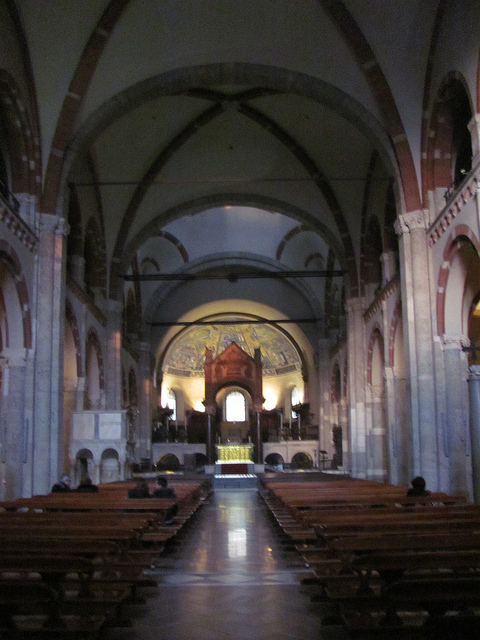 The Basilica Sant-Ambrogio in Milan, on the other hand, cannot span as great a distance, being a tenth/eleventh-century Romanesque construction. The Duomo is the largest interior space I’ve ever been in that wasn’t a hockey arena, if that gives you an idea of what Gothic can do. These pointed arches bear the majority of the weight of the roof and structure. Therefore, walls of glass become a possibility. When perhaps the walls alone are not enough, another Gothic innovation is the flying buttress. Flying buttress are supports on the exterior of the building that bear its weight almost as half arches, thus not casting shadows and saving light. 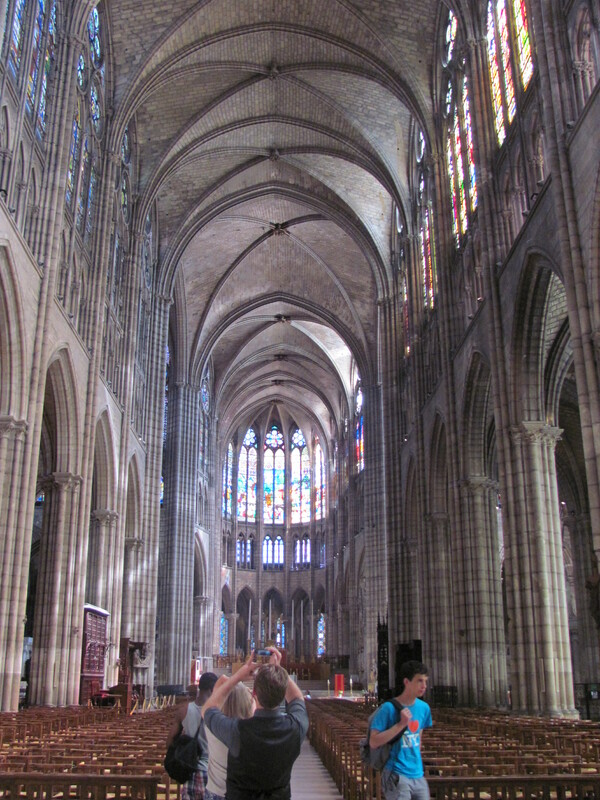 The double ambulatory at St. Denis has flying buttresses outside. 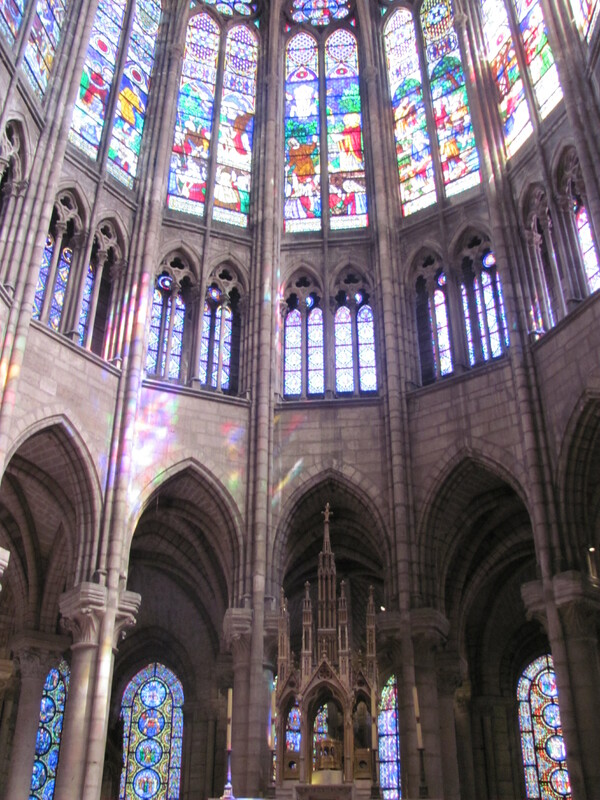 As a result of these two innovations, Abbot Suger’s double ambulatory is radiated with light on all sides, as the sun shines through the coloured panes and across the altars arrayed there. We often have an image of the Middle Ages as a dark, grim world. Gothic architecture defies the darkness and grimness of stone and allows God’s first recorded words to be realised in the space of worship – Fiat lux. Light, light, light. I write as though this is all that Gothic architecture cares about. To a degree, it is. My first encounter with a real Gothic cathedral was St. Sophia’s in Nicosia, Cyprus. Today it is a mosque (I found it amusing that my first Gothic church was a mosque). The walls are whitewashed and there is no ecclesiastical furniture, let alone statues, grotesques, frescoes, or mosaics, to adorn it. But it is a large, bright, cleanly-lit space. Some of the architects of the Gothic Revival in the nineteenth century believed that Gothic architecture was that form of architecture best suited to capturing and most devoted to embracing light. I think they may have been right. For more images of Basilique St-Denis, click here. There is also a Flickr Group called Gothic Churches. To contrast, check out the other Flickr Group Romanesque Architecture and Paintings.